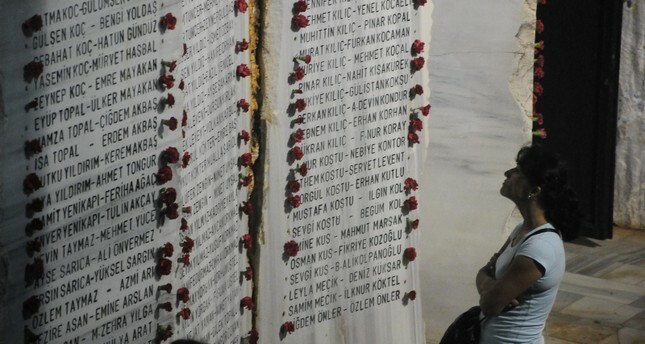 The 19th anniversary of the deadly Marmara Quake was marked with ceremonies across the nation, with people who lost their loved ones attending memorials at 3:02 a.m. Friday morning. In 1999, more than 17,000 people were killed and over 43,000 were injured when a 7.4 magnitude quake rocked the Marmara region for 37 seconds. The disaster's epicenter was Gölcük, a district in heavily industrialized İzmit province east of Istanbul. In addition to the casualties, the 1999 earthquakes caused extensive damage in Kocaeli, Adapazarı, Istanbul, Yalova and nearby towns in the northwest, which serve as Turkey's economic and industrial heartland. Speaking to Anadolu Agency (AA), Disaster and Emergency Management Authority (AFAD) Kocaeli chief Salim Tekoğul said the level of Turkey's earthquake preparedness was immensely ahead of the level it was in 1999. Tekoğul said he was personally affected by the 1999 quake, having lost several close relatives. "Everyone accepts that there was a huge lack of coordination in the search and rescue efforts at the time," he said, adding that all the relevant state agencies were combined to form AFAD in 2009. He said there were around 600 AFAD volunteers in Kocaeli alone, and the emergency response plans had been updated in 2013. There is also a concerted effort to create awareness among children and adults, he said, adding that its importance was clear considering that 3 percent of all deaths in the Marmara Quake had been caused by the failure to fix furniture in place. Volunteers were engaged in awareness, education and training campaigns, he said. In Istanbul, the Avcılar district on the European side was among the most affected areas, and several hundred people were killed when buildings collapsed. Since then, fears remain high with constant warnings from scientists that Istanbul, Turkey's most populated city and economic hub, will be at the epicenter of a "big one." At a ceremony in Adapazarı, many attendees began crying at 3:02 a.m., while an imam started reciting the Quran. One of those present, Suat Beyenal, told Demirören News Agency that his wife was among those who died that night. "I was in Australia when the quake struck. I was told my wife was found 3 days later. They buried her without me. I could come only two days after that." Similar ceremonies took place all around the region, including Yalova, Gölcük, Kocaeli and many small townships that were changed forever on Aug. 17, 1999. Turkey is among the world's most seismically active countries as it is situated on a number of active fault lines. In the latest earthquake-related disaster, more than 600 people died in October 2011 in the eastern province of Van after a 7.2 magnitude quake and powerful aftershocks. The most potentially devastating fault line in Turkey is the Northern Anatolia Fault (NAF) where the Anatolian and Eurasian plates meet. A strike-slip fault formed as the Anatolian plate was being pushed northwestwards by the Arabian plate, The NAF has produced devastating earthquakes throughout history, including the Aug. 17 earthquake. Three months later, on Nov. 12, 1999, 845 people died and nearly 5,000 were injured in when a 7.0 magnitude earthquake hit Düzce province, some 120 kilometers northeast of Gölcük. Studies conducted after the earthquake said that a total of 120,000 poorly engineered houses were damaged beyond repair, 30,000 houses were heavily damaged, 2,000 other buildings collapsed and 4,000 other buildings were heavily damaged. Some 300,000 people were left homeless after the earthquake. Years after the disaster, Turkey has seen an overhaul in measures to prevent damage from earthquakes, such as compulsory earthquake insurance and campaigns to raise awareness and inform the public about earthquake preparedness. Additionally, the government has undertaken an ambitious project of urban transformation wherein old and crumbling buildings across the country are being demolished to make way for new, earthquake-resistant buildings. Istanbul Governor Vasip Şahin, speaking at a ceremony marking the quake in Sultanahmet Square, said around Istanbul, an area totaling 18 million square meters was designated as post-quake meeting and evacuation points. He said around 2,500 public buildings were designated as safe areas to accommodate 2.5 million people if necessary with an additional 151 container camps that could house 1.5 million people. The head of the National Earthquake Observation Center in Boğaziçi University, Dr. Doğan Kalafat, told AA that a quake was a natural occurrence, while it was humanity that transformed it into a disaster with a lack of preparedness. He said there was a 70 percent chance that Istanbul will witness a quake measuring 7.0 on the Richter scale within the next 40 years. The probability increases to 95 percent in the next 90 years, he added. Murat Nurlu, a director at AFAD, said on Thursday that up to 30,000 people could be killed in Istanbul if a magnitude-7.5 earthquake were to hit the area. Speaking at a disaster preparedness workshop organized by the Istanbul Metropolitan Municipality, Nurlu said an estimated 50,000 people could be critically injured and 44,802 buildings could collapse. Some 2.4 million people could be left homeless.